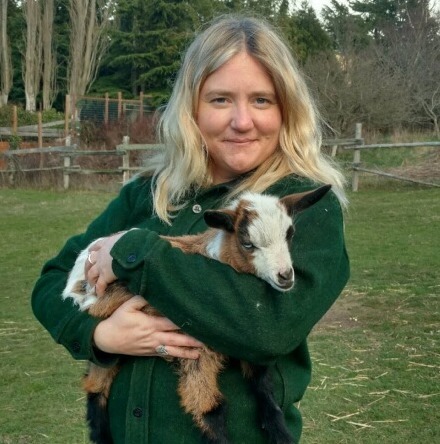 Kellie Henwood serves the agricultural community in her role as Regional Small Farms Coordinator for WSU Extension in Clallam, Jefferson and Kitsap Counties and assists farmers with resources and education. She coordinates for the Jefferson LandWorks Collaborative, sits on the Jefferson County Local Food Council and also the statewide WSU Food Systems Program Team. Kellie graduated from the Evergreen State College with a BA in Sustainable Agriculture and Food Systems and has worked on many organic farms throughout Washington state for ten years. From 2009-20011, she served on the Board of Directors for Tilth Producers of Washington, a statewide non-profit serving farmers. She is a certified compost facility operator by the Washington Organic Recycling Council. When Kellie was not involved in farming, she worked in the commercial fishing industry in Alaska and Washington state, which brought her to the Port of Port Townsend. Her other passions include backpacking, mushroom hunting, beach combing, gardening, spending time with her family, and playing rock and roll music.